The new Jane Austen £10 banknote was unveiled for the first time at Winchester Cathedral on 18 July this year, the 200th anniversary of her death. The much-loved novelist was buried at the cathedral largely because of the influence of her brother Henry, who was an Anglican priest. Her epitaph was composed by another brother James who wrote of her ‘extraordinary achievements of mind’ but famously forgot to mention that she wrote Pride and Prejudice or Sense and Sensibility. The new note will come into circulation officially in September and shows a portrait of Austen commissioned by her nephew James Austen Edward Leigh which is based on a sketch made by Jane’s sister Cassandra. The choice of the writer follows a campaign led by Caroline Criado-Perez to feature more women on British banknotes. With Winston Churchill replacing Elizabeth Fry on the £5 note, there was for a time no woman on any British banknote – apart, of course, from Her Majesty the Queen. 1. Winchester Cathedral. A finely detailed metallic image of Winchester Cathedral is positioned over the window. 2. See-through window – coloured quill. At the side of the window is a coloured quill which changes from purple to orange when the note is tilted. This effect can be seen on the front and back of the note. 3. Copper foil patch – JA. On the back of the note, there is a book-shaped copper foil patch which contains the letters JA. It is immediately behind the silver crown on the front. Polymer £10 banknote: back with Jane Austen. Photo Credit: ©Bank of England. The front of the new £10 banknote which has portrait of Queen Elizabeth II also has many design and security enhancements including a silver foil patch, coronation crown, microlettering, etc. Polymer £10 banknote: front with Queen Elizabeth II. Photo Credit: ©Bank of England. There are thousands of World Heritage Sites recognised and listed by UNESCO, but there are very few as intriguing, enigmatic and awe-inspiring as Stonehenge. 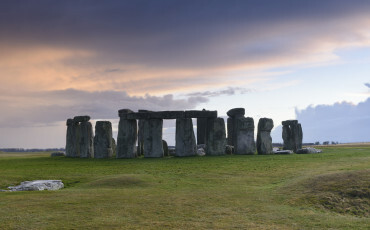 Stonehenge is one of the wonders of the world, the best-known prehistoric monument in Britain if not in Europe. 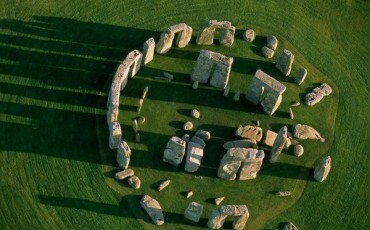 A stone circle, built almost 5,000 years ago, it still inspires with its size and construction methods. Visitors have to travel to Wiltshire to experience it but it is a journey well worth doing. Archaeologists say that Amesbury where Stonehenge is located might date back to 8820 BC, making the town the longest continuously occupied settlement in Britain.